If you’re presently looking to renovate your home, one of the products you may be considering is a bifolding door. In recent years the bifolding door has become hugely popular. It’s arguably one of the most sought after doors for anyone looking to extend or renovate their home. At Basfords we offer a choice of three outstanding bifolding door systems. These have been specially selected for their reliability, quality, impressive aethestics and great design. So whatever your requirements for a bifolding door we are confident we have the right product for you. Do your research and you’ll see there’s a lot of choice. There are bifolding doors in PVCu, timber, aluminium and even hybrid doors that use a combination of timber inside and aluminium outside. As bifolding door experts and having worked with this advanced doors for many years we share with you the benefit of our experience. Should the lowest priced door be the deciding factor? Basfords offer a choice of folding doors to meet all types of properties, design requirements and budgets. At Basfords we understand every customer has a budget. This budget can quickly escalate if you’re presently constructing a new extension. When it comes to bifolding doors quality is everything. There are a great many doors on the market that vary in quality of design and importantly quality of hardware. It’s the hardware and running gear on a sliding folding door that plays an important role in it’s long term reliability. We recommend you choose the best door you can afford. Our three products from Origin, Schuco and the new Warmcore door we are confident fall within most budgets and requirements for doors. With a bifolding door you do very much get what you pay for. When it comes to the cheapest bifolding door, PVCu will always be the lowest priced. Therefore if you desire the cheapest possible door it can’t be beaten. However a PVCu bifolding door has many limitations. But don’t just take our word for it. Speak to other professional bifolding door companies and you’ll find that they’ll advise you to choose aluminium every time. PVCu doors by nature of the material and their construction are prone to expansion, operational issues in the heat and are always thicker in their appearance than aluminium doors. In addition PVCu doors can’t manufactured as wide or as tall as aluminium doors. Neither can they offer the huge choice of colour. The other key difference in PVCu doors compared to aluminium is in the hardware. Look at any PVCu door and you will instantly notice bulky hinges and more obtrusive hardware. Talk to us and we can help you further. Are PVCu bifolding doors inferior to aluminium? Our quality folding doors are slimmer, stronger and can be made taller than PVCu doors. Our view is that PVCu doors are not a like for like comparison to aluminium. What’s true is that early variations of PVCu doors were not great doors. Things have improved quite a lot with these products over recent years. So whilst these doors are better than before they’re still limited by what can be done with PVCu when making large span folding or sliding doors. Aluminium doesn’t have these limitations. At Basfords we offer a offer a choice of Aluminium bifolds that we are confident will meet your requirements. From the industry leading Origin Door with its 20 year guarantee to our Warmcore door with exceptional U Values and design features there is a great choice. Visit our showroom and see our range of quality and affordable bifolding doors. All our door brands offer you the best in security, quality of operation, colour choices and value. What about timber bifolding doors? The timber door is excellent but is at the upper end of the price range for bifolding doors. The materials used to make timber doors have also come a long way with long guarantees available on quality, paint finish and reliability. However timber doors still need routine care. If the paint finish is damaged on timber doors it must be promptly repaired to prevent further problems moving onto other areas of the door. Aluminium has the advantage that it won’t rot, twist, warp or suffer should water soak the material. How many bifolding door leaves are best? 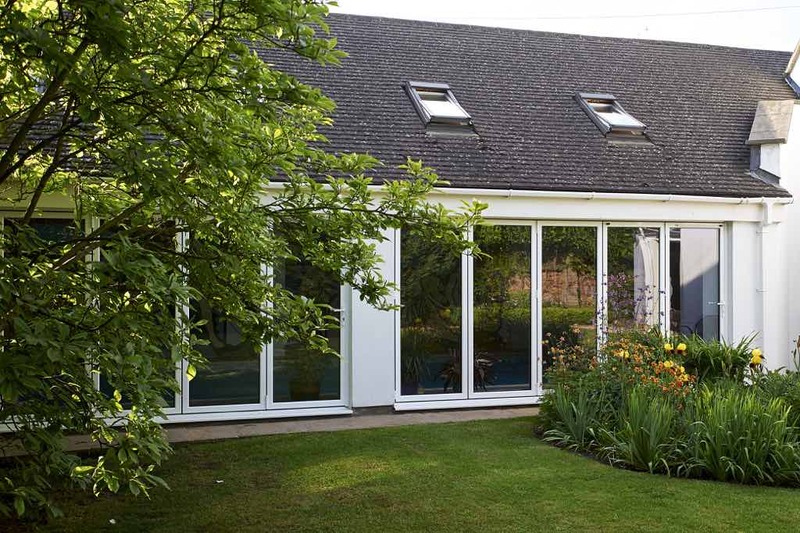 Bifolding doors are available from two leaves right up to seven or more. The choice of how many leave or door panels is down to many factors. The more door leaves obviously the higher the cost. But it also depends on the overall size of the opening the doors are going into. Come to our showroom and look at the various options. You can also talk to one of our trained team who can explain the various features of less or more door leaves.